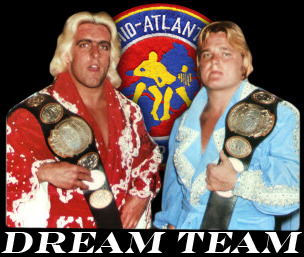 Events that occurred at the tail end of 1978 provided the “Dream Team” one last chance to team up and go after the World Tag Team Championship. Unfortunately for Ric and Greg, this final opportunity came about because they lost their respective singles championships within days of each other! On December 26, 1978 in Richmond, Valentine and Raschke lost their World belts to the new combination of Paul Orndorff and Jimmy Snuka. Only four days later in Greensboro, Flair dropped the United States belt to Ricky Steamboat in a vicious Fence match, where Steamboat put his hair up against Flair’s Title. The short reformation of the “Dream Team” in January and early February of 1979 was not successful at all as far as wins and losses, but did result in exciting matches and gave credibility to the young and relatively unknown new World Champions, Paul Orndorff and Jimmy Snuka. Ric and Greg didn’t regain the World Tag Team Titles, but they definitely made Snuka and Orndorff work hard to retain their newly won belts! Flair and Valentine first squared off with Snuka and Orndorff for the World Tag belts in the Richmond Coliseum on January 5th, and three days later the same two teams went at it again on the other side of the circuit in Greenville, South Carolina. While Jimmy and Paul got the dukes in both those bouts, the matches were hyper-competitive and it looked like the program could go either way when the four met again for the World Titles on January 13th in the Greensboro Coliseum! The match lived up to the hype, and Ric and Greg probably came closer to recapturing the “gold” here than in any match they would have with Orndorff and Snuka. There were several moments in the bout where it appeared Valentine and Flair were going to add to the impressive list of Greensboro Coliseum title changes, but it ultimately did not come to pass. The “Superfly” and Orndorff edged out the former champs, and left Ric and Greg pondering a number of missed opportunities. After the Greensboro loss, Flair and Valentine appeared on Mid-Atlantic Championship Wrestling television as a team on January 17th, and were as confident as ever. Ric and Greg were at their dominating best as they easily dispatched their TV opponents, the veteran Abe Jacobs and the youngster Herb Gallant. The “Dream Team” followed up on their TV appearance with one of their best efforts in the program with Snuka and Orndorff, battling the Champions to an ultra-physical double disqualification in the Norfolk Scope Coliseum on January 25th. But the rest of January was forgettable for Valentine and Flair, as they dropped decisions to Orndorff and Snuka almost daily; on January 26th in Lynchburg, Virginia, January 27th in Savannah, January 28th in Greensboro and January 30th in Columbia, South Carolina. Things did not improve for the Flair-Valentine team in February of 1979, but as Greg Valentine was set to head north and wrestle in the WWWF full-time, the program with Orndorff and Snuka for the World Tag Team Championship was mercifully almost over. February 1st saw a rematch in Norfolk, following up on the wild double disqualification finish from a week earlier, but Jimmy and Paul controlled the action in this one. Raleigh’s Dorton Arena on February 6th, Charleston’s County Hall on February 9th and Spartanburg’s Memorial Auditorium on February 10th were home to the final bouts of this program, which were all wins by World Tag Team Champions Paul Orndorff and Jimmy Snuka. These were also the last bouts ever featuring Ric Flair and Greg Valentine as a regular tag team. But it did not spell the end of Ric Flair and Greg Valentine attempting to team up, and even teaming up on several rare occasions in the future. Some very interesting interactions between Ric Flair and Greg Valentine were definitely looming down the road! Stay tuned for PART 6 of "The Dream Team!"